"The combination of violin and guitar is eminently portable and begs for music that is similarly versatile, both technically and stylistically. Guitarist matt Gould and violinist Beth Ilana Schneider-Gould, Americans now based in Cyprus, certainly rise to the challenge in this collection, which showcases a handful of mostly thirty-something composers who have no problems seamlessly integrating the two instruments in a way that smoothes over any residual stylistic baggage. Whereas most pieces for this combination fall at polar extremes - either creating musical statements that neglect to incorporate the essence of the instruments, or empty displays of idiomatic virtuosity that forget entirely about making music - the composers commissioned by Duo46 can write serious music while letting the guitar sound like a guitar. part of the advantage is brevity. No piece in this collection goes on for more than eight minutes, and the result is one of intense concision rather than scarcity of ideas. Pierre Jalbert's "Sonatine" condenses an emotional whirlwind into its seven minutes, while Kristi McGarity's cheeky suite, "How the hell are You Felling? ", twists its chromatic motive in three distinct movements. The Strad "VIRTUOSIC AND FLAMBOYANT"
"The unusual and richly hued sonorities of violin and guitar are comprehensively explored in this flamboyant and virtuosic disc of chamber works, all commissioned by Duo46-violinist Beth Ilana Schneider and guitarist Matt Gould. The pair flaunt their gift for the most spontaneous and fresh delivery from the outset, with Anthony Joseph Lanman’s Sonata 46, which starts out wild, edgy and raw only to turn contemplative, sonorous and seductive. The improvisatory, almost jazzy feel of Kristi McGarity’s How the Hell are You Feeling? shows the players in their element, particularly in the heartfelt romancing of the central movement. Jalbert’s Sonatine contains some brilliant contrasts, from the sustained, sad sweetness of the second movement to the leaping and fiery Presto agitato, which builds to a galloping climax. Disparate elements provide inspiration for Joshua Penman’s Was the Sky as Liquid, from flashes of Baroque figuration to the driving rhythms of drum ‘n’ bass. Penman instructs the performers, ‘All told, the piece should groove,’ and groove it certainly does. Neil Flory’s Venn Music I explores the duos potential for different textural effects, the instruments throwing trill figurations and Bartokian pizzicatos back and forth, and drifting in and out of unison. Stacy Garrop’s Untaming the Fury, the disc’s title track, with its heady emotions, provides a riotous finale. classical guitar canada "Twentieth-century music at its best"
Twentieth-century music at its best, the trail-blazing violin and guitar duo has triumphed with this release. 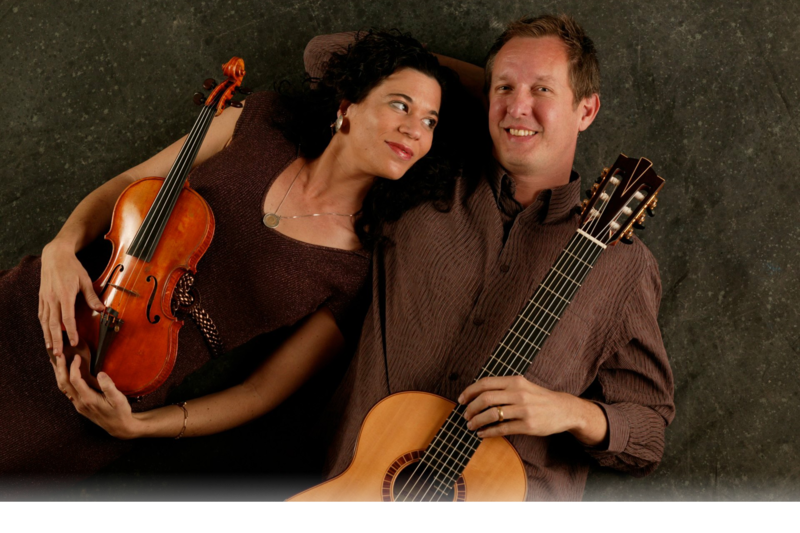 Guitarist, Matt Gould, and violinist, Beth Ilana Schneider-Gould, feature ten compositions from ten American composers written for the Duo46 at the turn of the millennium. The promise alluded to in the disc’s title is made good upon hearing the opening track, Sonata 46, by Anthony Joseph Lanman (b. 1973). In wonderful liner notes which are comprised of statements from each composer, Lanman describes his work as “full of polytonal, polyrhythmic, contrapuntal mayhem.” The duo rises to the task here and in the fiery title track by Stacy Garrop (b. 1969). These works serve to bookend the music journey. However, wild and fiendish playing is only one side of this disc. In between these two bonfires is a plethora of intriguing and aurally satisfying works beautifully performed and recorded. Joshua Penman’s (b. 1970) was the sky as liquid is stands out as a unique blend of pointillist minimalism combined with lip-curling splashes of baroque counterpoint. Daniel Adam’s (b. 1956) Quandary is a rhythmically playful study through a generally minimalist approach as well. Here, a mosaic of ostinatos and melodic cells are set against each other in a Stravinskian manner and the composer’s subtle blending of the guitar and violin sonorities is deftly capitalized on by the duo.The fifth track, Kristi McGarity’s (b. 1971) How the Hell are You Feeling? is a breath of fresh air. This is music with a physical presence and the balance and orchestral colours achieved by composer and performers is a revelation. Pizzicato, harmonics, arco, golpe, con legno, rasgueado, glissandi are put in a blender and set on high – we no longer care if the resulting sonic gems are being produced by Gould’s fingernail or Schneider’s horsehair! For those whose aural sensibilities have trouble stomaching anything verging on integral serialism, Structures No. 412, as the title suggests, is the most Boulezian on the disc. Neil Flory’s (b. 1970) Venn Music also tantalizes the intellect by providing an exploration of texture and timbre. But, the strength of the disc is its range of expressive strategies. For example, Sonatine by Pierre Jalbert (b. 1967) features some wonderful writing in double stops for the violin carried out beautifully by Schneider. This works comes closest to a violin sonata with guitar accompaniment, but is intriguing (as one of the meatier pieces on the disc) and has some supremely dark and lyrical moments. On the other hand, Russell Sarre’s (b.1963) Two Pieces for Guitar and Violin and Paul Richard’s (b. 1969) intriguingly-titled Asphalt Gyspy, contain some of the most traditional and successful writing for the guitar on the disc. As a result, a sonorous and satisfying sound is achieved that is comparable to such successful (if not cutting-edge) guitarist-composers such as Andrew York or Carlo Domeniconi. Two pieces is the least virtuosic of the works on the disc, but it is perhaps the most satisfying in its capitalization of the inherent traditional capabilities of the guitar and violin. Asphalt Gypsy lives up to its name relying heavily on piquant modal elements winding through elements echoing Falla and Bartok. What often plagues new guitar chamber music is a lack of rigour in the guitar part. However, Duo46 avoid this pitfall as the compositions on this disc feature Gould’s excellent guitar playing and Schneider’s impeccable violin artistry equally. The guitar – which can often be intimating for non-guitarist composers – is featured and matched beautifully with its complement. In the end, one finds that Duo46’s performance on this release is similar to the dialectical and paradoxical character of the late twentieth-century work that it features: at times intimate yet domineering, lyrical yet percussive, sensual yet abstract – but, always balanced and satisfying. new front ears "Sound, fury and the still centre"
As if to prove that the revived American interest in classical tonality is not simply the reduction of artistic possibility to a 'good chune', Duo 46 (Matt Gould - gtr; Beth Ilana Schneider- vl) tear hugely imaginative patches from the tonal repertoire of the past few centuries, studied and vernacular. Not that they are without their hooks and riffs, too. Ten composers responded to commissions for a series of demanding chamber miniatures. The result is hugely varied -- from sunny Iberia to melancholic central Europe -- and rarely short of compelling. The scores are all available through Alfieri e Ranieri Publishing. The temptation in this context is throw as many ideas into a small ring as possible, both for writer and performer. Occasionally these pieces succumb to that temptation. But they can also be profoundly developmental and contemplative at the same time (Russell Sarre). Gould and Schneider are musicians of rare sensitivity, unforced reflexivity and effortless virtuosity, coaxing unexpected twists and twirls from the Mikhail Robert guitar (1999) and the Alceste Bulfari violin (1985). These performances have a paradoxically controlled yet 'near live feel'. The recording and mastering allows the different accents and colours to flood through. You easily forget that you are listening to just two varieties of wood and string. Some of the compositions on this disc betray their origins, loves and influences with declamatory force. Others (Joshua Penman's 'Was The Sky As Liquid') reinterpret them with surprising subtlety -- drum'n'bass and Baroque harmony, curiously interwoven. Duo 46 is all about breaking boundaries - emotional, harmonic, rhythmic, and textural. But there is nothing contrived or forcedly 'transgressive' about either their playing or what they play. 'Untaming The Fury' is ensemble music for grown ups who like to dabble and frolic, but not in a dilettantish fashion. At its heart is perception; a still centre. And incidentally: if you've ever wondered what a Venn Diagram would sound like, Neil Flory has the answer pinned down in just 7 minutes -- an overflowing circumference of dreams. On the title track (by Stacy Garrop) the acoustic suddenly flattens. The notes indicate a 9/11 connection. The buck stops here. Each piece is introduced by a pithy liner comment; just enough to leave the ears to do the most important work. Professor William S. Haney's paean of praise lends floridity a new gear -- but you can see his point. The sunny cover is tastefully restrained (but just as atmospheric), in contrast. I missed Gould and Schneider's debut album, 'FM1: Homage To The Fifties'. Seeking it out is now a clear priority. The duo also works in other contexts (the None and Strung Out Trios, for example) and has performed on four continents. 'Untaming The Fury' encapsulates their art in just over an hour. In their end is their beginning... I shall return to this disc often, I am sure. Duo46 US 1999 Tour with premiere of Untaming the Fury, the title track of the CD on Summit Records.